The stadium is located in Southampton, and has been the home of Southampton FC since 2001. The history of St. Mary’s stadium is still in its infancy, but the history of its tenants is a tale that had its beginnings way back in 1885. St. Mary’s stadium was built after it was decided that Southampton FC’s home at the time, The Dell, was too small for a team competing in the top levels of the English football hierarchy. There had been talk of moving since 1984 but it took until 1998 for the project to gather enough momentum to become a reality. The city council offered the football club the chance to build a new ground on the site of a disused gas works just a mile and a half from The Dell. This pleased both the club and the supporters, as the site was located next to the church, the very people who had formed Southampton almost 113 years previously. Construction began in December of 1998 and was completed at a cost of £32 million in July of 2001. The ground officially opened on 1st August 2001 with a friendly game against Spanish team RCD Espanyol, with The Saints losing 4-3. The stadium has four stands, each named after the areas of Southampton that they face: the Itchen stand, the Kingsland Stand, the Chapel Stand and the Northam Stand. It also has hospitality suites named after its most famous players; Terry Paine, Mick Channon, Bobby Stokes and Matt Le Tissier. If you are visiting the stadium and you are interested in placing a football bet, please use our recommended betting sites. The Dell was Southampton’s home before moving into St. Mary’s and they played there for 103 years. Curiously, a fish merchant was responsible for acquiring the land where the stadium would be constructed. Known locally as ‘The Dell’ due to a description of the area in Philip Brannon’s ‘Picture of Southampton’ as ‘a lovely dell’. The description would stick when it came to naming the new stadium. Find out about the history of Dean Court stadium too. We have plenty of information for you to enjoy. The 24,500 capacity, £10,000 stadium was ready for the beginning of the 1898-99 season. In 1927 the West Stand was demolished and made way for a larger one. A dropped cigarette in the East Stand burned it to the ground in 1929 and a new stand was built. This took capacity up to 30,000. The Second World War saw a bomb dropped on the stadium creating an 18 foot crater, and munitions stored at the ground exploded causing the West Stand to burn down. The Dell became the first ground in England to have permanent floodlights installed in 1950 and huge crowds flocked to The Dell, culminating in a record 31,044 attendance in 1969. 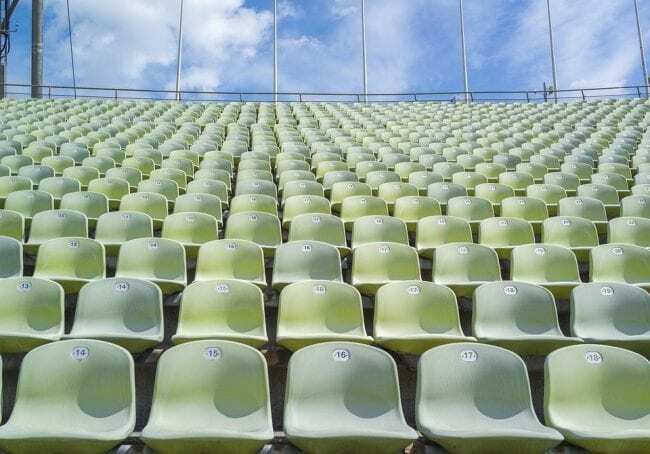 Redevelopment continued throughout the 1980’s but with the introduction of the all-seating rule, The Dell’s capacity plummeted to just over 15,000. The wedge-like shape of the Milton Road Stand was identified as a prime example of the difficulty of expanding The Dell further. The Dell finally closed on 26th April 2001 with fans stripping The Dell of its seats, turf and advertising boards as souvenirs. The Dell was demolished by July 2001 and is now a housing estate where the apartment blocks are named after the players. This is completely different to the capacity of Old Trafford Stadium that has a capacity of over 70,000. The Southampton Stadium originally opened in 2001 with the name ‘The Friends Provident St. Mary’s Stadium’. The club wanted a sponsor-only name for the venue, but supporters objected. When Flybe took over as main sponsors in 2006, the name reverted back to the Stadium. It currently has a capacity of 32,505, more than double the capacity of The Dell. If you are interested in finding out about the history of other stadiums like the history of Turf Moor, then please have a look around our website. 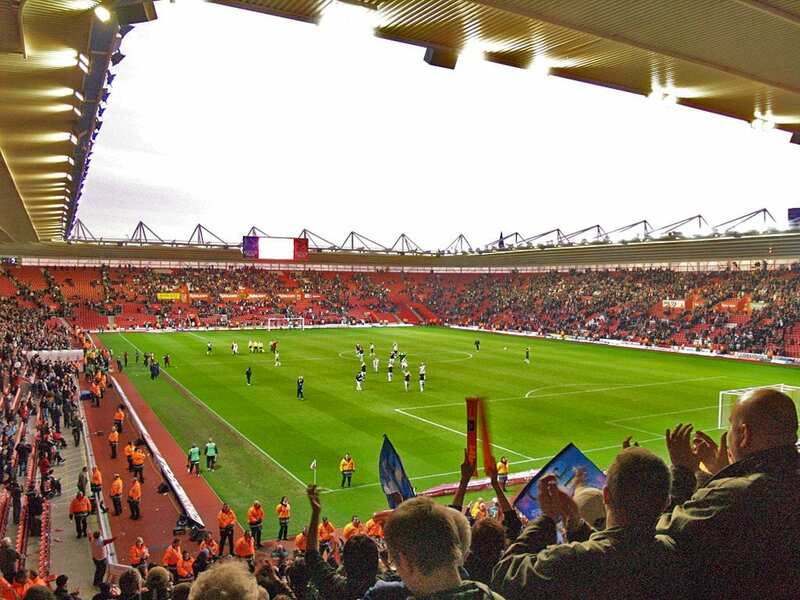 Southampton FC had a long history before moving into St.Mary’s stadium. Formed on 21st November 1885 by members of the Church of England Young Men’s Association. They were originally known as St. Mary’s Young Men’s Association FC, before condensing this to the FC in 1878. They joined the Southern League in 1894 and changed their name again to Southampton St. Mary’s. They won the 1896-97 league and became a public limited company, changing their name one last time to Southampton FC. The FC won the Southern League five times in seven years but found time in 1898 to move to what would be their home for 103 years, The Dell. The club joined the newly-formed Football League Third Division in 1920 and were promoted to the Second Division in 1922 where they would stay for 31 years. 1953 would see The Saints back in the Third Division and not return to the Second Division until 1960. The team were finally promoted to the First Division in 1966 before being relegated again eight years later. Success would come in 1976 with an FA Cup win, which brought with it European football. After returning to the top flight in 1978 they would come close to winning more honours but always seemed to pip themselves to the post. This pattern continued throughout the 1980’s and early 1990’s despite players like Matthew Le Tissier, Alan Shearer, Kevin Keegan and Peter Shilton in their ranks. The FCs nickname has been ‘The Saint’s’ since their formation. This refers to their origins of being formed by St. Mary’s Church of England and the name has stuck with them ever since. Life in the Premier League wasn’t much easier and Southampton Football Club battled relegation for much of the league’s first decade. In 2002 a new era began when The Saints left The Dell for their new stadium, St. Mary’s. The new stadium would see 3 seasons of Premier League football before Southampton were demoted on the final day of the 1995 season. Financial problems ensued and the club had to sell most of their best players to stop themselves going bankrupt. Worse was to come in 2009 when a ten point penalty was imposed on the club for going into administration, but because the team had already been relegated, it meant that the penalty would be carried over to the following season. They started the 2009-10 season in League Three with -10 points. Miraculously, not only did they finish in 7th position, but they also won the Football League Trophy too. They then achieved back-to-back promotions and were in the Premier League again by 2012. Tickets are best purchased from the club themselves. Visit their official website at https://southamptonfc.com/tickets/match-tickets for information on how to get the best Southampton FC tickets for home, away, and for the full season. If you need to be brought up to speed with the latest results, just go to http://www.bbc.co.uk/sport/football/teams/southampton/scores-fixtures for the results, expert analysis of the game and interviews with the managers and the players.